2017 Supplier of the Year | Judd Wire Inc.
Turners Falls, Massachusetts – May 25, 2018 – Judd Wire, Inc., announced that it was recognized by Fokker Elmo B.V. as their best overall supplier of the year for 2017. 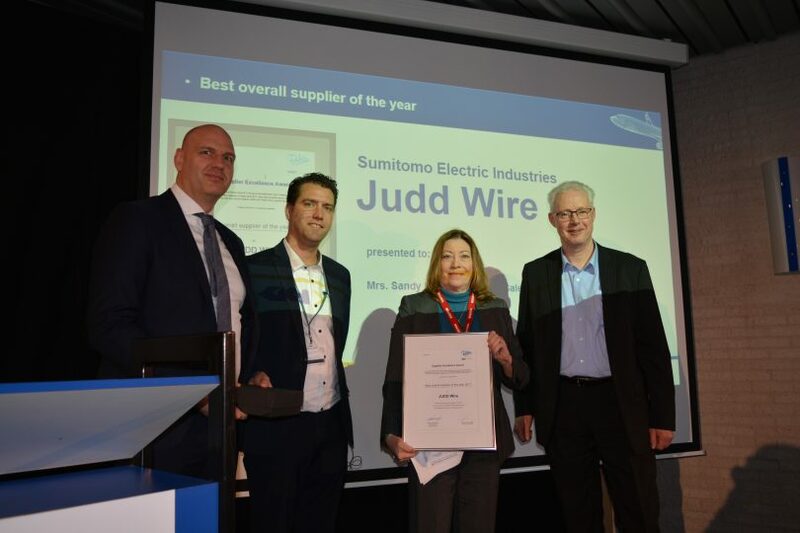 Judd Wire, a high-tech wire company that designs and manufactures electronic wire and cable for customers in the aerospace industry such as Fokker Elmo, was given the award during a supplier day event at Fokker Elmo’s headquarters in Hoogerheide, Netherlands, on March 20. It was the first time for Judd Wire to receive this award, which is given each year to the company with the highest overall score in Fokker Elmo’s five key categories of cost, quality, compliance, cash, and delivery. Judd Wire is among dozens of specialized partners that make up Fokker Elmo’s global supply chain. “Judd Wire appreciates this recognition and the opportunity to supply lightweight, high-reliability specialty wire and cables to Fokker that withstand harsh aerospace environments. We’re pleased to meet the ever-increasing needs of Fokker’s global Aerospace Supplier Excellence Program,” said Michael Banach, Judd Wire Aerospace Product Manager. Fokker Elmo specializes in the design, certification, and manufacture of electrical wiring interconnection systems for aircraft manufacturers. One of the company’s key areas of focus is wiring harnesses, which it develops in conjunction with a network of specialized partners around the world. Fokker Elmo is based in Hoogerheide, Netherlands, and operates as a subsidiary of GKN plc, a global Tier One multi-technology aerospace supplier (www.gkn.com). Judd Wire manufactures economical, high-performance electronic wire and cable for the automotive, aerospace, railway, and other industries. The company specializes in the use of electron beam crosslinked thermosets for wire insulation, and manufactures wire and cable in over 100 styles that conform to UL, CSA Group, or military specifications. Judd Wire is a subsidiary of Sumitomo Electric Industries, the largest wire and cable manufacturer in Japan. For more information, visit www.juddwire.com. Career Opportunities: Current Openings at Judd Wire, Inc.